When I heard that there was a new bottle on the market that warmed itself in only 60 seconds, I was really impressed. There's nothing worse than being out and about and having to warm up milk in a bowl of boiling water. How can you be sure sure that it's warm enough, or whether it's too hot? Yoomi, it seems, has the answer. Although I'll be honest with you - preparation is the key with this one! You see although it only takes 60 seconds to heat the bottle you actually have to put in a lot of effort at home to enable this miracle to happen! The warmer (the fancy space type looking device) needs to be placed in a pan of continuously boiling water (or an electronic steam steriliser) for 25 minutes to give it it's magical powers. I found that this was quite a long time for a busy mum - but if you knew you needed it the next day then obviously, being the organised soul that you are, you'd charge it the night before. When we went down to the baby show I forgot to do this in advance and in the 4am panic I gave the charger to my mum to boil - she didn't take it out of the cardboard packet though - the result was a pan full of wet cardboard! I realise this may not seem funny to you because you had to be there but I almost wet my knickers laughing when I saw what she'd done -Numpty! Once the warmer has been boiled for 25 minutes you then have to leave it to cool for 75 minutes! Unfortunately for us, this meant we couldn't take it to London as we had to dash for the train. So we kept the warmer all charged up and ready for another day. So on our next expedition we took the fully charged warmer and bottle and off we went. Once charged, the warmer sits within the bottle and is activated by pressing the orange button on the top. This triggers the internal solution to warm the unit in just 60 seconds. The feed is then gently warmed as it flows through the specially designed channels on the outside of the warmer. By the time the feed reaches the teat, it is at natural breast milk temperature (32-34 deg C). Not only that, the warmer has been specially designed to stay warm for up to one hour. It did exactly what it was supposed to do and warmed my milk to body temperature and Little E loved it. The only problem we had was the milk came out a little fast for her and it all got a bit messy so we will be buying some slow flow teats. Overall it's a great product but just be prepared for the time it takes to warm it up (and cool down!) and remember it has to be recharged after every use so if you're going to be out and about for a long time then you'll need a couple of warmers with you. Find out more information on Yoomi's website. 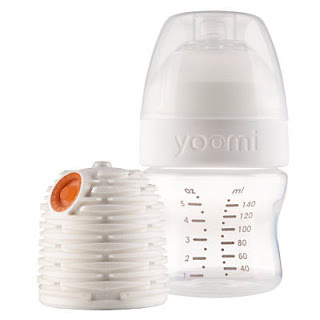 Yoomi bottles are available to buy in the UK from John Lewis, Mothercare and JoJo Maman Bebe or in Ireland from BabyWear Brands.